This is a really great “wheat meat” to use in rice paper wraps with rice noodles, fresh veggies, cilantro and mint. It’s also wonderful as the anchor for a southeastern Asian-styled meal. Seasoned from the inside out with coconut milk, Thai basil, ginger and chili pepper, it’s full of flavor and has a chewy texture that is very satisfying. Add all the dry ingredients into a large bowl and whisk together until homogenous. Sauté the onion, garlic, ginger and Serrano chili in the coconut oil over medium heat until soft. Using a spatula, scrape the contents of the pan into another bowl. Add the remaining wet ingredients except for the coconut milk and water. Add the coconut milk to a measuring cup and then add enough cold water to bring the liquid volume to 2 ¼ cups. Add to the bowl with the wet ingredients. Mix well. Combine the wet and dry ingredients using your hands to gently knead them together until you no longer see any dry ingredients in the bowl. Break off whatever sized pieces you wish to form the patties with. [Mine were roughly golf ball-sized.] Using your hands, form them into the patties and then either cook in a pan with a bit of coconut oil for about 4-5 minutes per side over medium heat, or place in a Panini press for about 5 minutes. [I used a Panini press for this and it worked beautifully.] The length of time is going to be determined by how firm you wish the patties to be. The longer they’re cooked, the more they toughen up in texture. You can also place a flat lid, that is smaller than the pan in which they are cooking, atop them to add some weight to hasten cooking time. These look delicious! 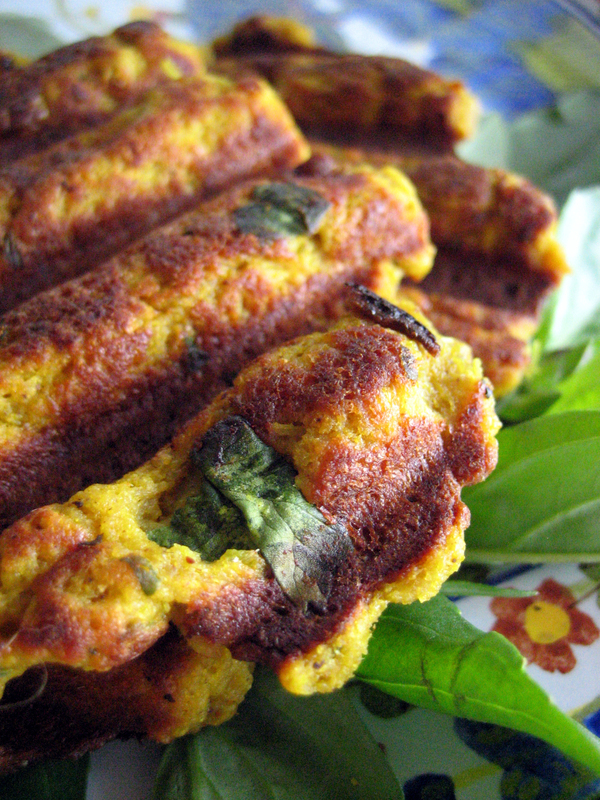 I’m a huge fan of homemeade seitan and I adore Thai flavors! They work really well together and give Thai flavors to something with more texture than tofu, which is a really nice change of pace once in a while. Wow D, this looks amazing!! You are so creative. I wish I was your neighbor so I could try all your tasty noms!!! Bill’s Best Chik’Nish is a powdered vegan broth that has the savory and herby flavor of chicken soup. I would substitute with a vegan soup bouillonthat is either in paste form or powdered. In a pinch I would substitute the cold water with a cold vegan stock. The reason that I use Bill’s is because it adds a concentrated flavor without adding excess liquid.